I had a friend tip me off to a little Antique Mall just a few miles out of town. 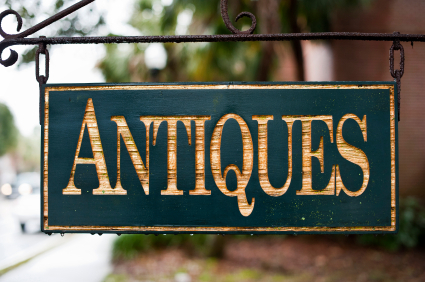 I went there this week to see what kinda of amazing retro treasures I could find. Unfortunately the place was filled with mostly old junk. Between the used romance novels, broken tools, lamp shades and 1987 Topps Baseball Cards I found these sweet items! Let's walk down the aisles and take a look. In the early 90s Cool Spot the 7up mascot was everywhere. 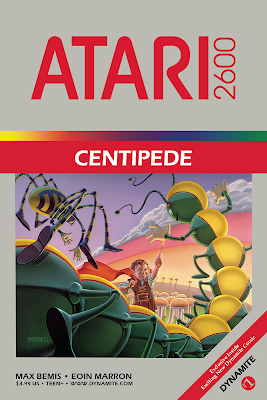 He even had his own Nintendo game! 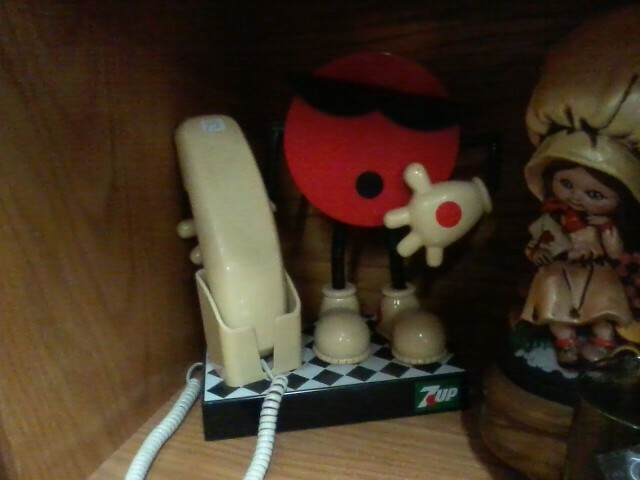 I love seeing this little guy when I go to these antique stores. Sure it makes me feel old, but it brings back some nice memories. I don't collect phones and I don't even have a land line that I could connect this to if I did, so I passed on bringing Mr. Spot home. I saw this album cover in a corner next to a power strip and freaked out a little. We used to have albums like this when I was a kid. 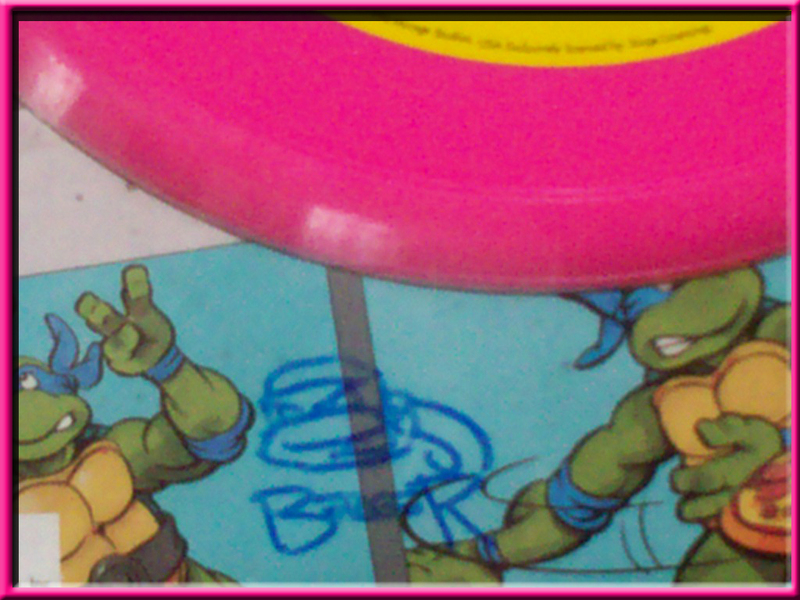 We had everything from super heroes to Strawberry Shortcake to those Disney records with the pictures printed on them. I was a little disappointed to find that this was just an empty sleeve, but at least I saved myself a few bucks? Anything with the words "Electronic" and "Talking" definitely gets my interest. I never had this toy as a kid, but wouldn't mind having it in my collection. 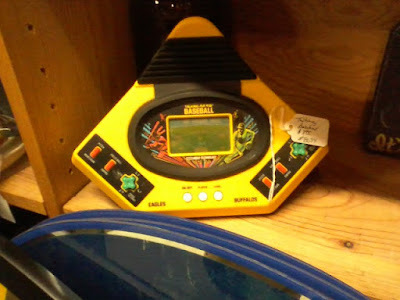 I have quite a few old handheld electronic games at home. If it's there next time I go, maybe I will pick it up for the reasonable price of $3.98. Only problem is I couldn't tell if it worked or not. The "As is" tag kind of scares me off from buying toys like this. I wanted this mug! The $10 price tag made me put it back on the shelf though. This would have been on my shelf at half that price. 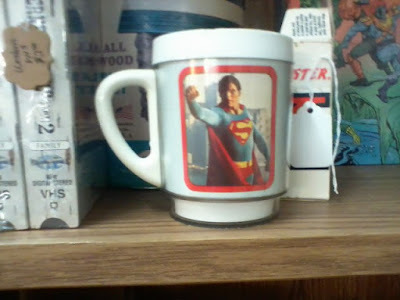 I love the old Christopher Reeves movies and this piece was in nice condition, but once again I really don't collect mugs. I'll pass and save my money for some more Superman trading cards or the elusive (to me) jar of Superman Peanut Butter! That baby has been on my wish list for a long time! 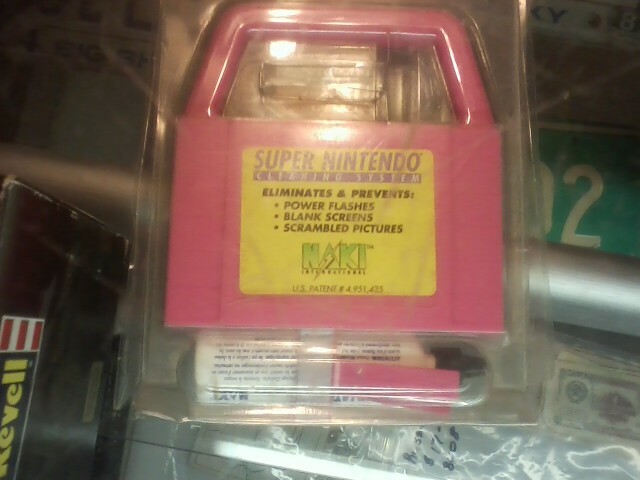 NAKI Super Nintendo Cleaning Kit: $? This was a complete NAKI Super NES cleaning kit from the mid 90s. Everyone had something like this. Me and my brother actually had the official Nintendo cleaning kit for our SNES that was shaped like a SNES cart and actually did a pretty good job of cleaning our system whenever it would get a bad case of the blinks. I considered buying this, but it was in a locked case with no price tag in sight. This puzzle was the one item that I really fought putting back on the shelf. A SEALED MASTERS OF THE UNIVERSE GOLDEN PUZZLE from 1984! I love the artwork and I am a huge MOTU fan, but I'm sure I couldn't justify this purchase to the wife. Maybe next payday? I saw a few other things that I liked there like some McDonalds International Beanie Babies, some Domino's Pizza Hats and a Baby Mickey Mouse toy. All in all there was nothing incredible there, but I will be making a return trip sometime in the future. Ugh! 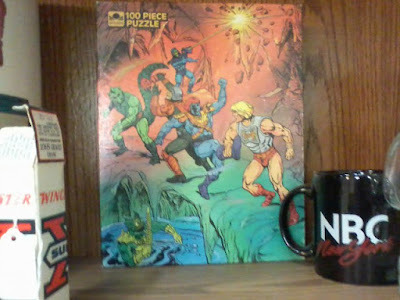 Why did I not buy that He-Man puzzle? 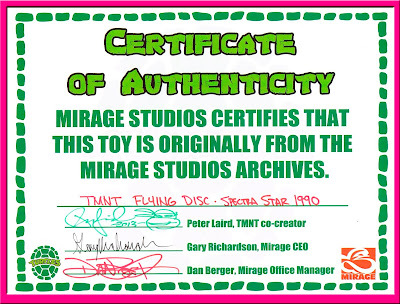 If you have been recently visiting the official Mirage Licensing website, you have seen that Peter Laird has been holding ebay auctions each week for vintage Teenage Mutant Ninja Turtles items. These range from hard to find items like a sealed Scratch action figure to McDonalds Happy Meal Toys. 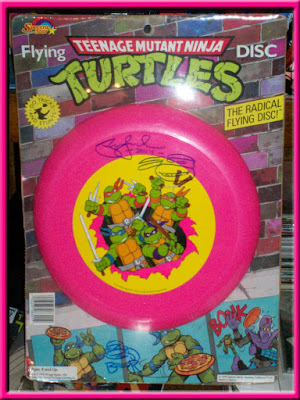 One item that caught my eye was this TMNT Flying Disc from the early 90s! The artwork on the package is classic Turtles and the neon pink color of the Flying Disc is totally a signature color of the 90s! 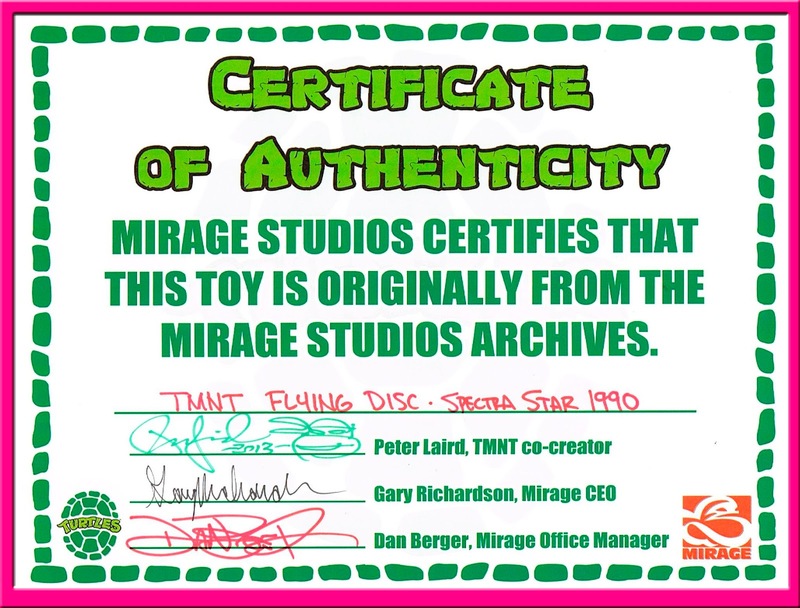 I placed a $10 bid and one week later, I had won this amazing TMNT relic straight from the Mirage Studios headquarters archives in Northampton, MA! The coolest thing about this item is that it came autographed by Peter Laird himself! Yes, that Peter Laird! 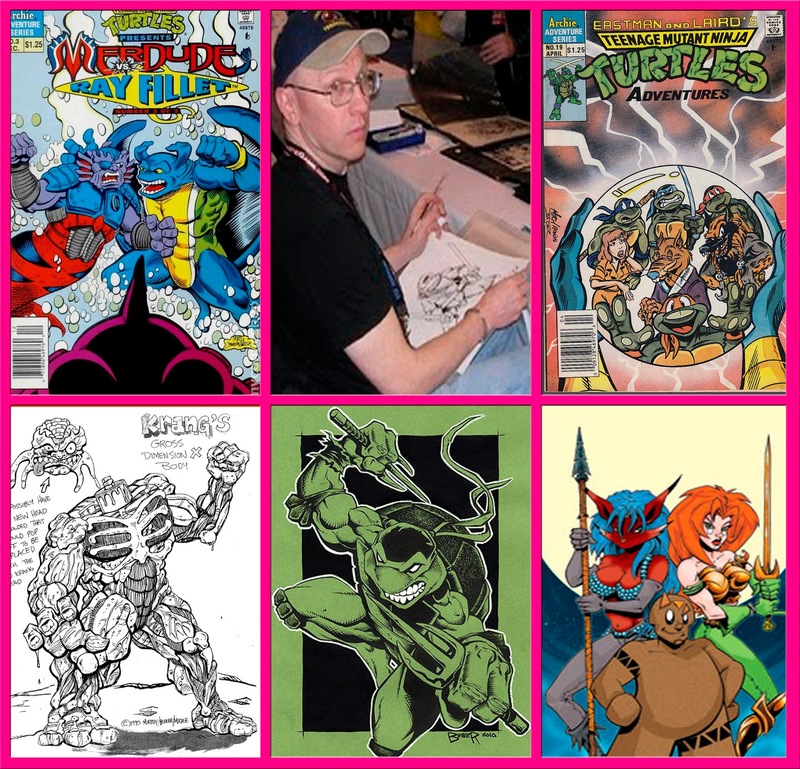 Co-creator of the Mean Green Machine and father of the Teenage Mutant Ninja Turtles! Being a huge fan of the Teenage Mutant Ninja Turtles since I was a child, I had always wanted to own a piece of memorabilia that had been signed by the Turtles creators. This was an inexpensive way to do that. But that's not all, while paying for my item through PayPal I put in a request for Dan Berger to sign the Flying Disc also! And he did it! 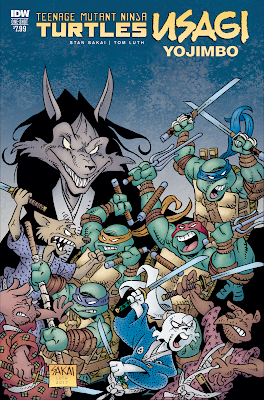 For those of you not familiar with Mr. Berger's work, he worked on the early issues of the Archie published Teenage Mutant Ninja Turtles Adventures series before moving to the main TMNT title in 1989. Berger also created the independent comic Gutwallow and came up with the TMNT character Merdude! He is currently Managing Editor of Mirage Publishing and maintains The Mirage Group Website. As a lifelong fan, I am extremely happy to have this item in my ever growing Teenage Mutant Ninja Turtles collection. I am very careful with it though. 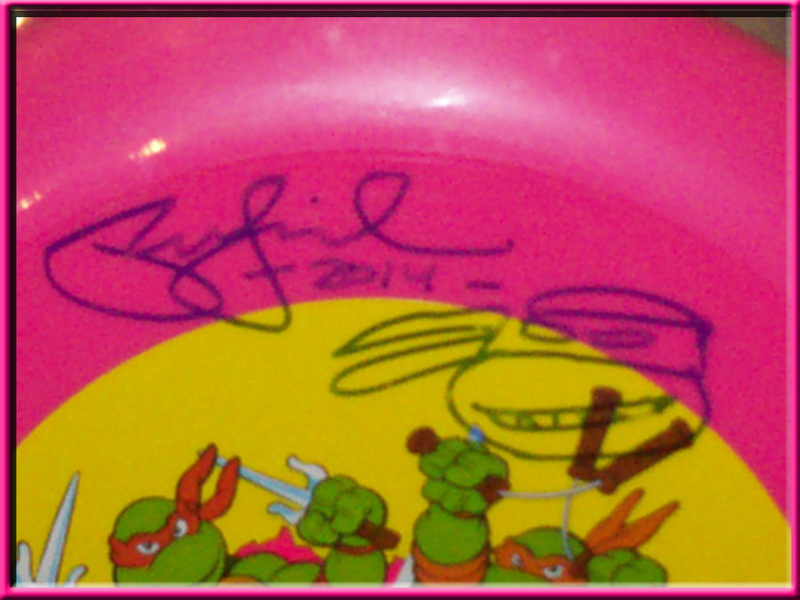 Since the guys signed on the plastic wrapper, any little poke or tear could ruin it! Gotta keep this baby up high and on display in my man cave/kids playroom. DuckTales (woo-hoo) returns! 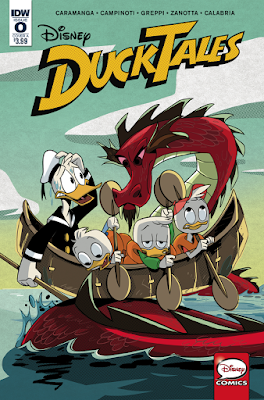 Featuring beloved characters like Uncle Scroohge, Donald Duck, and Huey, Dewey, and Louie, this new #0 issue is the perfect jumping-on point for fans old and new in anticipation of the brand-new Disney XD TV series coming Summer 2017! Experience the wackiest, quackiest hijinks in two brand (Duck) Tales! 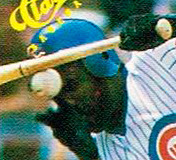 This has to be the worst Baseball card photo of all time! I mean seriously, what is going on here? 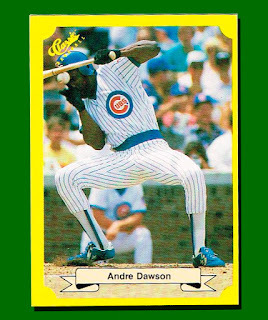 This is Andre "Awesome" Dawson! One of the best sluggers of the 80s, a hall of famer and an all-time great. Why did Classic choose this picture out of all the shots I'm sure they had? Why are Dawson's legs so oddly posed? Is he really taking a fastball to the head? What happened after this shot, did a fight break out? So Many Questions! My theory is that Dawson approached the plate and in a moment of both cockiness and craziness he decided to perform the Funky Chicken dance to insult the pitcher. Earlier in the game the pitcher, let's say it was Bret Saberhagen, threw a curve ball that Dawson took over the fences. In retaliation Saberhagen throws at Dawson's head as his body flails from his epic dance moves. The pitch connects and Dawson goes down! 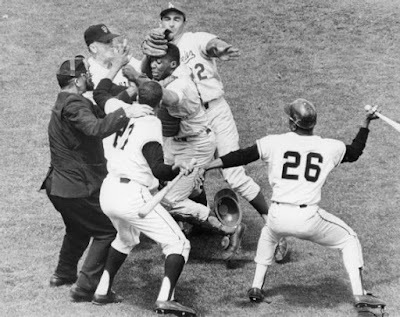 A huge fight ensues and the game is called due to every player on the field being knocked out by each other's wild haymakers. That is what I choose to believe happened on that infamous day in Chicago. Sorry to waste your time with this post. I got this card out of a pack and so many questions blew through my mind! 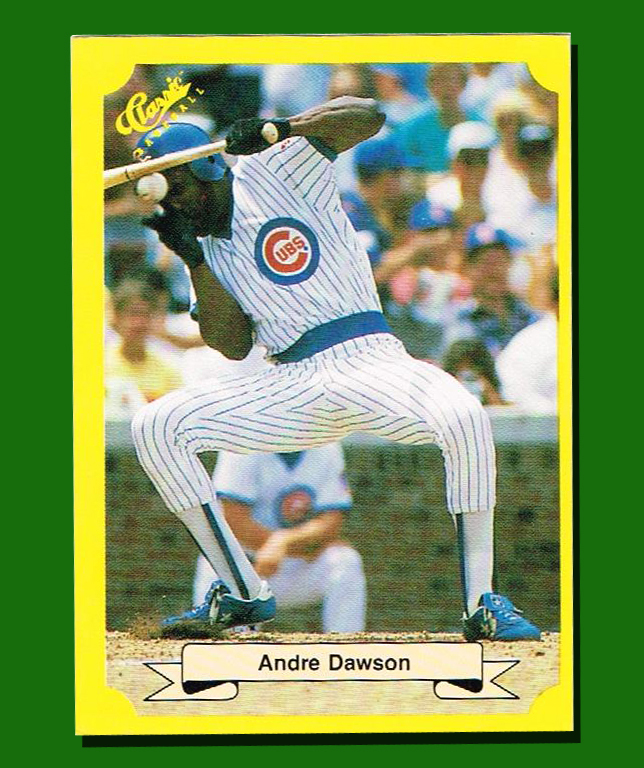 Let's all celebrate Andre Dawson and his wackiness in this video from his outstanding MLB career as a Cub! The year was 1987 and some of the hottest toys on the schoolyard were G.I. Joe action figures! Every one of my friends had G.I. Joes. The thing that was so great about this toy line was that there were so many Joes to choose from, so everyone had different commandos to send into battle against the evil of COBRA! Since me and my older brother were big into these guys, one year we each found a pair of G.I. Joe Sunglasses in our Easter Baskets. We thought we were as cool as Sergeant Slaughter in those babies! Unfortunately for me that feeling of unbridled awesomeness and badassery would end all too soon! I foolishly took my G.I. Joe Sunglasses to school and they got lost somewhere? A few days later a kid by the name of Mikey came to school wearing the very same glasses I had. Naturally I thought he stole mine and we got into a fight. Parents were brought in and it turned out Mikey's parents had bought them for him! The mystery of the missing G.I. Joe Sunglasses was never solved, but I think my brother had something to do with it? 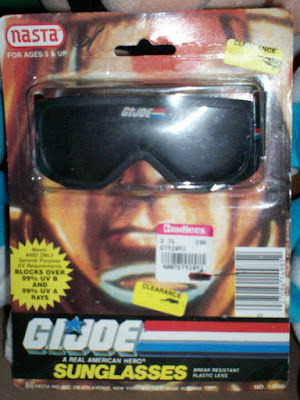 Last year I was able to put the heartache of the 80s behind me when I purchased a pair of G.I. Joe Sunglasses off of ebay for around $3! I am totally okay with them still having the old Bradlees and Clearance stickers on them. I believe these just add to the charm. 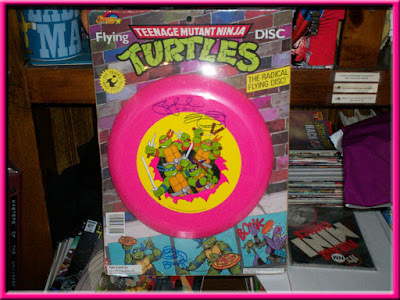 Now I can cross these off of my wish list and Mikey if your out there, I am sorry for fighting you over a pair of plastic sunglasses in grade school...unless you really did steal them, in that case I am not sorry and you got what you deserved. I feel better now and that is half the battle...Right? Based on the classic Atari game! When a terrifying creature from beyond the stars attacks his planet, Dale's journey begins. But he is not out to save his world. It is already too late for that. As the lone survivor, the only thing he wants is revenge! Writer Max Bemis (Worst X-Man Ever, Foolkiller) and artist Eoin Marron (Sons of Anarchy Redwood Original) bring you a tale of survival and vengeance like you've never seen before. I got suckered in again by the Dollar Tree! This recurring theme may become a problem. 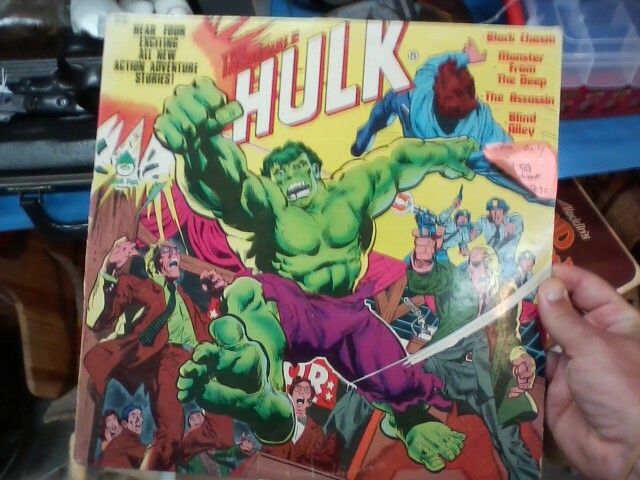 But seriously when you see a 1984 Incredible Hulk Annual for $1, could you pass it up? I obviously couldn't. The story inside is kind of ho-hum. The Hulk ends up on a tropical planet, a symbiote spine attaches itself to Hulk, hilarity ensues and in the end the spine sacrifices itself for the better good. 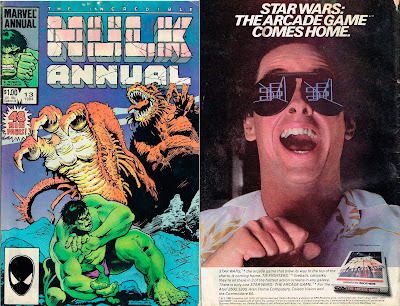 Not the best Hulk story ever told, but the 80s advertisements inside were amaze-balls! 1984 was a time when Atari ruled the world and this is reflected in the ads. 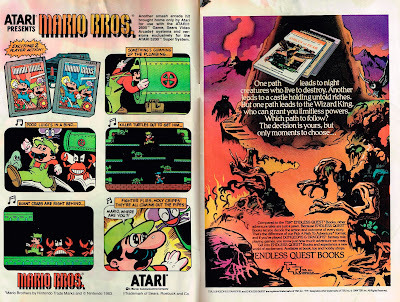 We not only got the insane back cover Star Wars Arcade Game ad, but the original Mario Bros. ad! 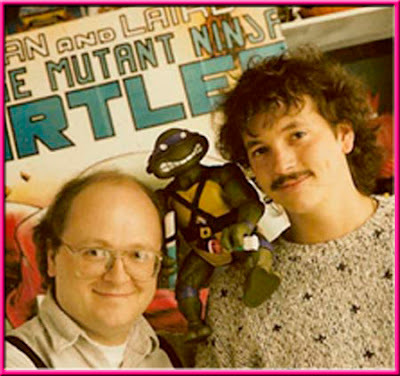 This was before the Brothers became Super and were just cleaning crabs and turtles from pipes to earn a buck. 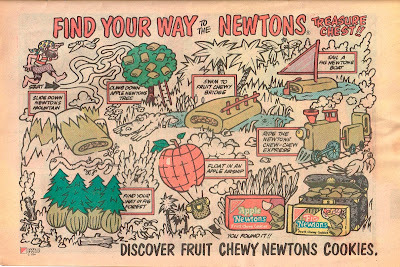 So simple, but so much fun and look at those retro drawings. That is Mario at his best! 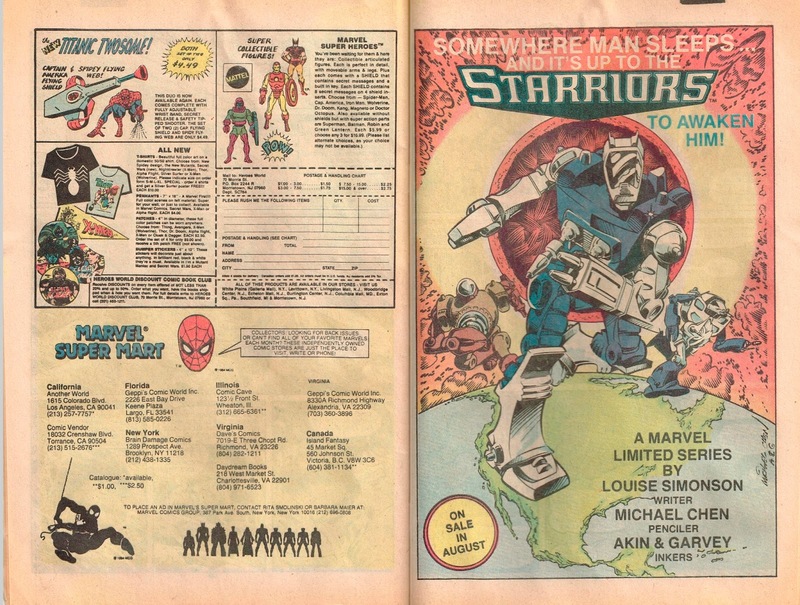 The next ads were a whiff of nostalgia as they included Secret Wars figures for $5.99 each, a Captain America Shield & Spider-Man flying web for the low price of $4.49 and an All-New black costume Spider-Man shirt for $10! All OUTSTANDING BUYS!!! 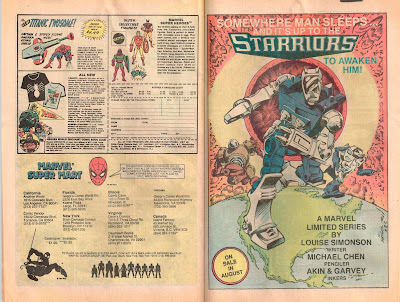 The next page featured an ad for the Tomy toys inspired comic series Starriors! I had one of these guys growing up and they were pretty cool. Definitely one of the more underrated toy lines of the 80s. These next ads I added because of the oddity of them. I did not know the NYCC went back this far. In 1984 tickets cost only $9 and the show was held at the Omni Park Central Hotel! A far cry from what the con is today. The other ad for Military Diamond sales just seems so odd and out of place. 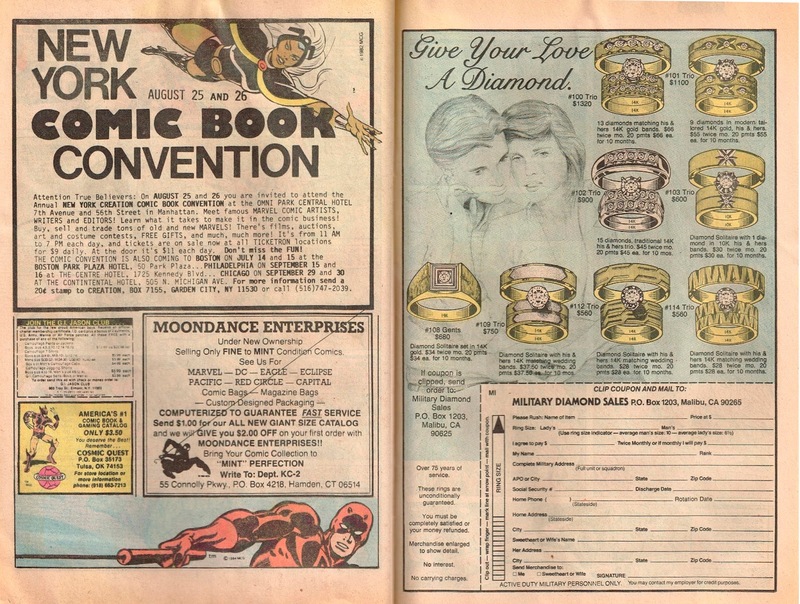 In 1984 comics were still geared mostly towards kids, so what was an ad for $700 diamond rings doing in this comic? Who bought the ad space? And why is that sketch of the two people so damn creepy? Am I the only one who liked ads like this? Yes they were trying to sell me something, but they were also a fun activity. 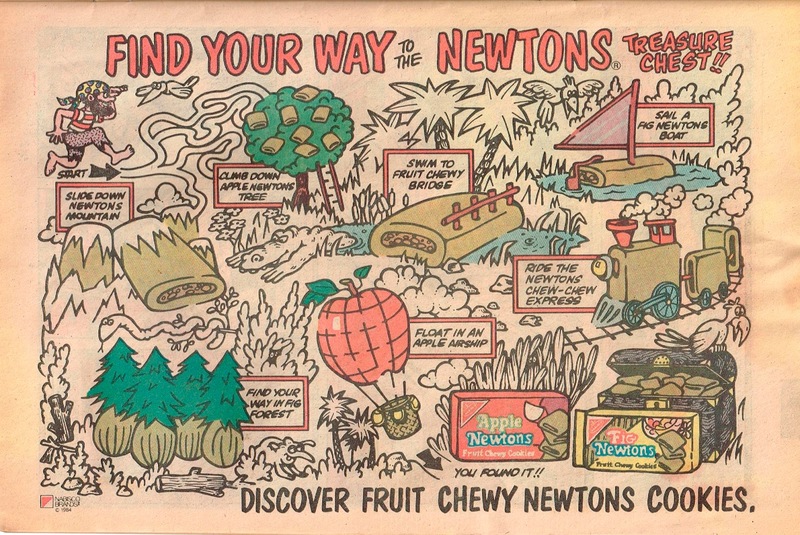 Fig Newtons always had the best ones. 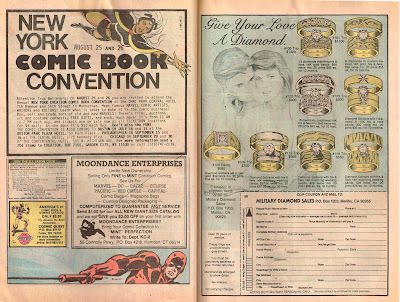 I always viewed ads in comics like commercial breaks during cartoons. You had to hold my attention to keep my eyes on your product and these ads did just that! 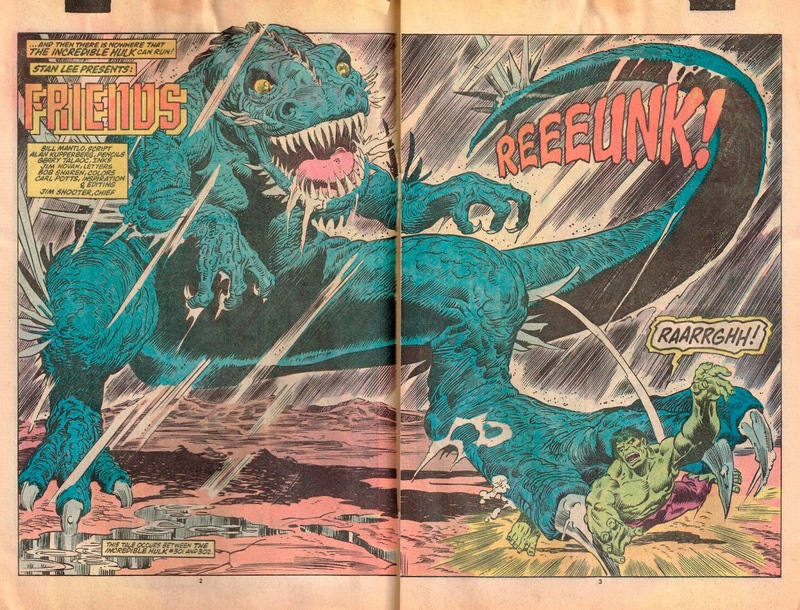 I guess there was one more cool thing in this book....A FREAKIN SPLASH PAGE OF HULK GETTING CRUSHED BY A HUGE DINOSAUR/DRAGON THING!!!!! RAARRGHH! "Aftermath"! Gotham City is at peace...but a war is coming. 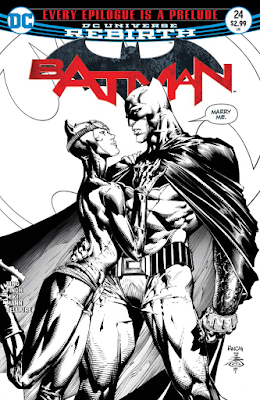 Armed with the terrifying knowledge gained from the mysterious button, Batman prepares for the coming storm by making a proposition to one of his enemies-one that will change everything for the Dark Knight and his allies! Enjoy your 4th of July everyone! See some fireworks, attend a block party, play some baseball, enjoy a hot dog and relax with the smooth sounds of New Jersey's own Bruce Springsteen performing "Born in the U.S.A".